People were waiting for the Official Facebook Messenger from long time. Because, Nowadays we have a lot of problems with their Facebook chat. Most of them are unable to see their friends online. Its not that they are not online, its just that Facebook chat got some serious issues. Well, to be frank, Facebook chat is really not doing that great. People are facing a lot of issues from months now. Earlier, in the month of December, Facebook Messenger was leaked where millions of people were happily using it. Facebook wanted to launch its officially Facebook messenger without any bugs. So they have stopped the service and started to build a better application which can supports windows 7 platform. Recently Facebook has officially launched the new Facebook Messenger for windows 7. This client is really simple to use. 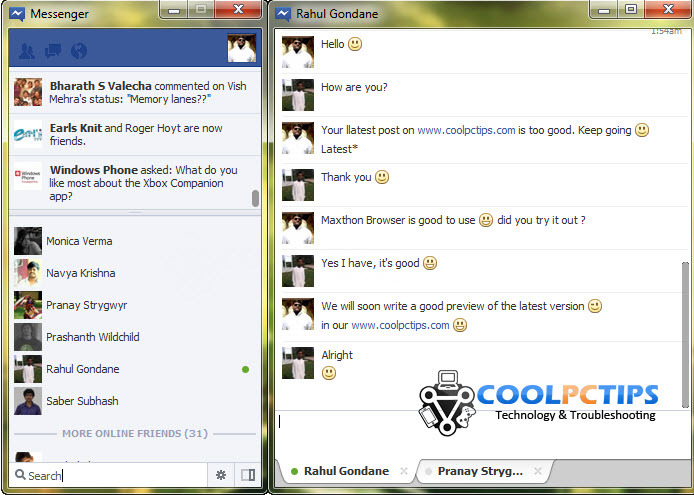 It has any amazing interface where you can chat with your friends and get immediate notifications. Also you can find the Facebook New Ticker in the upper part of the messenger. With just 500kb in size, The Facebook messenger is really working like a charm. People can actually see each other online and also are able to respond to one another. This simple application was the same when it was used way back in December 2011. But the new version is launched without bugs and errors. The application will give you an updated information on Notifications, News Ticker, proper chat facility. The application is perfectly designed for windows 7 desktop. If you are a Facebook Junkie, you should have this application installed. You can actually use this application and increase your productivity without missing a beat if something important happens in your Facebook. Its a very effective messenger. Thanks for the update. 2. your slider in header section shows only single post…. 3. i want to be in your blogroll…..